« The Cobblestones all look the same. 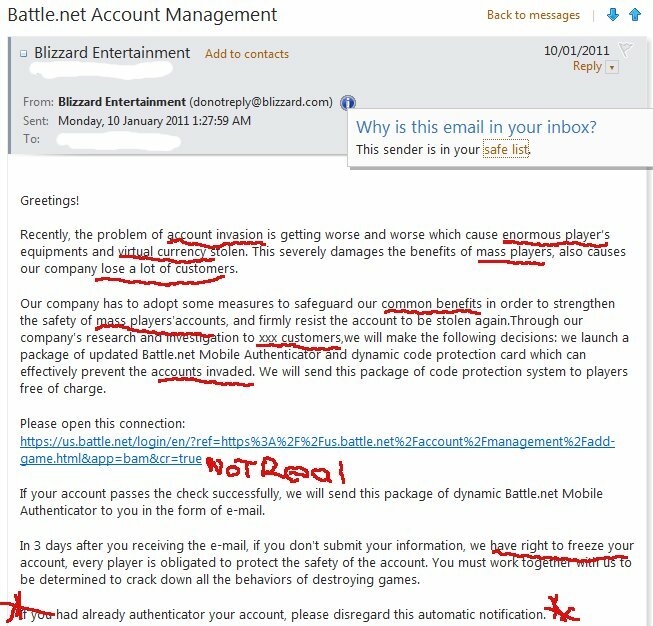 There is alot of signs that it is certainly not a real email from Blizzard, and is in fact a spam/phishing email. I find the “account invasion” most funny. Of course if you mouse over the blue link text you get a slightly different link. Translation: Your going to be too hard to hack so we shall not bother. Oh – Level one characters whispering me ” Are you there Zahraah?” ( typical gold selling introduction) get the hint when I reply ” Not if your trying to sell me gold” and I was only saying yesterday I need to learn to say ” F Off ” more. Damn this being polite business. Those poor enormous mass players. Why do they always pick on them? Somebody think of the ogre children. I’ve always responded to suspected level 1 gold-sellers who contacted me with a “hello” or an “are you there?” with either, “Hello!…” or “Yes, but I don’t want to buy gold, thanks!” and never had a problem. Rightclick on his name, “report spam”. It’s fun to string the gold sellers along (If they are not a bot it puts a dent in their productivity). I once told one that I was interested in buying….but that I didn’t have internets so I couldn’t buy. He seemed confused and so I asked if he sold internets, he told me they accept the usual payment forms and delivery is right away. It was good times. Sometimes I respond to those level 1 sellers with a “Ni hao!” and any other Chinese I scrounge up. They must get the message and never respond. The other day I tried Japanese. (“Good evening! Do you have gold?”) The seller actually responded and tried to get me to buy gold. I still get emails inviting me to the Cataclysm Beta…. I usually reply with a whisper wherein I try to sell them gold. They usually just bugger off, though sometimes one bites and I get to string them along for a while. I find it so funny that they go to so much effort of faking a website, a link and an email so it looks almost exactly like the Blizzard stuff (not that I’ve ever clicked on to a fake site so I suppose I wouldn’t know), but can’t be bothered getting someone who can speak English to actually write the email. You can just check the grammar and know straight away it’s a fake. NEVER click on any of these links. Zero day exploits are common, your computer can be silently taken over just by viewing the website, with no further clicking or pop-up boxes required. Don’t mess around or take chances, it’s not worth it. Personally I always respond to the “are you there?” spammers with “I hate you” followed by “We all hate you”. I saw an interview with a Chinese gold spammer who said that was particularly upsetting for them.